Known for her big hair, big makeup and big voice, Dolly Parton is considered a living icon to many. She may have a ‘Barbie doll’ façade but in conjunction with this, she has used her business acumen to build the ‘Dolly’ brand into a multi-million dollar enterprise, proving you can have brains and beauty. It is understandable then, why playwright Jaswinder Blackwell-Pal uses Ms. Parton as the guardian angel and life coach within her new play The Poetry We Make. This touching work examines with sensitivity, the struggles of finding your true identity, and the upheaval to your life, and that of your loved ones, it may cause. Elliott and Robin have been a couple for four years, steadily and lovingly travelling through the steps of a relationship, such as moving in together. However, Elliott’s world is rocked when she discovers that Robin has made the decision to start his transition into becoming a woman. 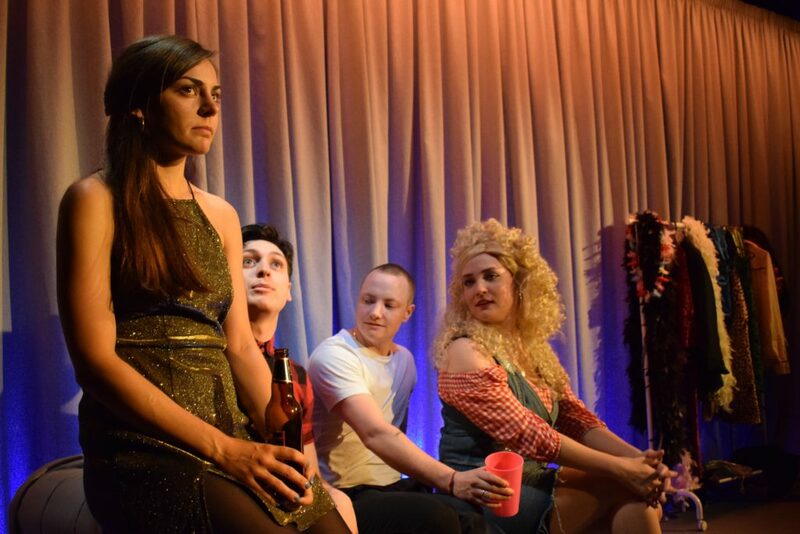 Whilst metaphysically revisiting her memories, Elliott questions the legitimacy of their relationship, what it means to be a woman and where love can lie – all done with the supervision of her hero, Dolly Parton. Dolly offers words of wisdom through song and apparition, enabling Elliott to find peace and acceptance. Elena Voce as Elliott and Elijah W Harris as Robin, have a natural chemistry and believability to their relationship that is lovely to encounter, making it more heartbreaking when you see the dilemma’s they both go through. Sam Thorpe-Spinks injects some needed humour as Robin’s best mate Paul, whose laddish behaviour subsides to present his affection and support of his friend’s decision. Mia Hall in full rhinestone-encrusted ‘Dolly’ garb is a lot of fun without being too gimmicky. Hall is a warm, sisterly figure to Voce’s Elliott, whilst also exhibiting her powerful singing voice through the musical interludes between scenes. As strong as the performances are, there are certainly times when it feels let down by the writing. Jaswinder Blackwell-Pal does a good job at being thoughtful with the subject matter, without ever shying away from questioning what gender and identity means in this day and age. However, it is the construction of the scenes (particularly the flashbacks) and their placement within the production that can confuse. In summary, the content is great but the structure feels a little rough around the edges. The Vaults space within the Waterloo tunnels are certainly not ideal for The Poetry We Make, being too narrow for any kind of wings. Nevertheless, the company manage, finding ways around this issue, creating the small and intimate environment that the story requires. This thought-provoking love story is one that I feel Dolly Parton would approve of. Like she does in her songs, the play addresses serious, sometimes philosophical issues of the heart, whilst executed with warmth, sincerity and a small serving of humour.